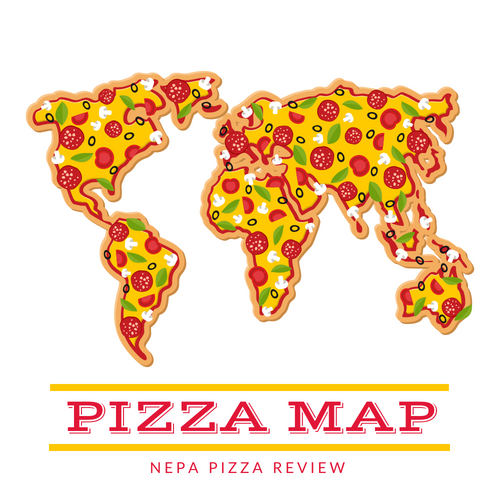 I have to say that when I started this blog, my intention was not to review chain restaurants, but after being nagged by a buddy affectionately known as "the bird man" and watching countless Domino's commercials on TV about the new fresh pan pizza dough, I thought I might break into new markets. I must admit, the extent of my consumption of Domino's Pizza has historically come after 2am in a hotel room after a long night on the town, so I usually order out of convenience rather than desire. Perhaps now that Domino's has a new recipe and a new look, maybe it is worth a shot to actually take the time to visit a take-out location. Upon visiting, I have to say, I was impressed with how clean and modern the place was. 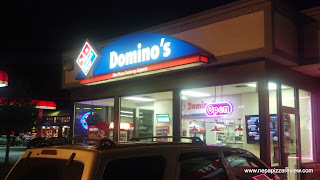 The staff was ultra-professional, and let me know that I could get 2 free toppings on my pizza, which of course I took the bait and ordered a medium with sausage and mushrooms. I was told the pie would be ready in 10 minutes, and low and behold it was ready right on time. 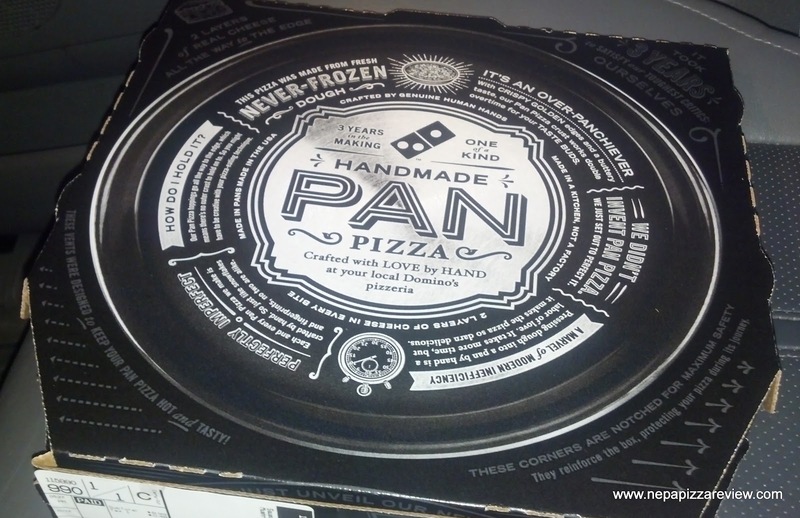 When I picked up the box, I was amazed at how heavy the pizza was inside. This was probably going to be a heavy meal. 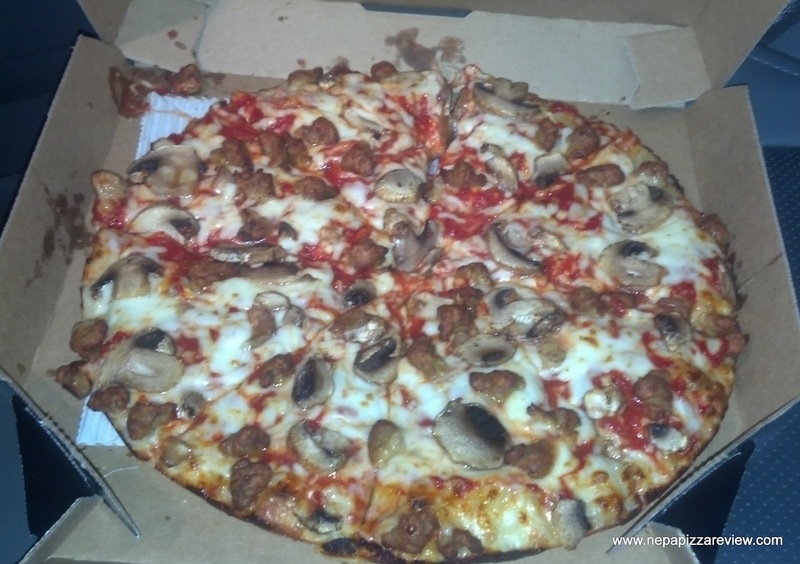 First glance netted about what I would expect from a Domino's pizza, cooked just right and consistent. The pizza was quite thick and clearly had generous helpings of cheese and sauce. From the top down, I thought the toppings were pretty standard, dry mushrooms and processed sausage balls. It's a good thing Domino's strategically includes these toppings in the price, because it gives the cheap (although admittedly better than the old cheese) some much needed help in the flavor and texture departments. Domino's cheese has always been relatively dry and flavorless, which isn't 100% the case here, but as I said, the toppings do really give you a sense that it's a higher quality cheese. The sauce is actually pretty good, and a vast improvement over the old sauce. It's a bit sweet, but with better texture, and some more complex Italian seasonings than in the past which was a welcome improvement. The crust was nice and thick, slightly crisp on the bottom, and really fluffy and soft in the middle. To me, the novelty of a pan pizza is the "deep-fried" bottom layer which crunches and is packed with oily flavor which this didn't have. Instead we had just a nice touch of golden brown, which in all reality, my arteries were probably pretty happy about. Also, I don't think it's too easy to get the deep fried effect on a pan pizza in a conveyor pizza oven, where the idea is to heat everything evenly and all the way through. 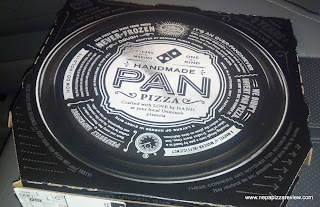 Either way, nothing about this pie was bad, in fact, I thought Domino's Deep Dish Pizza 2.0 was pretty good! On a side note, although Domino's isn't the greatest pizza of all time, it is very good leftover pizza! Check out how this simple, yet little known way to reheat pizza back to it's freshest state!